“We will continue civil disobedience until Nnamdi Kanu is released.” It is a known fact that IPOB is rooted in every community and town in the South South and South East. Our presence is felt even in remote villages where IPOB family members are preaching the gospel of restoration of Biafra. So rather than diminishing, our influence is growing on a daily basis. We are still rallying as ever, coupled with our more direct approach, our positive impact is resonating amongst the people. Our presence in over 88 countries of the world is a testament to our global influence. What people mean when they question our potency is that they miss the towering influence of our leader Mazi Nnamdi Kanu. Truthfully speaking, even enemies of Biafra miss him. Everybody it seems have come to the realisation that our leader is the only person that can make a telling difference that is capable of shaking the foundations of Nigeria. The marginalised and the oppressed all miss him. Nobody should expect millions to march on the streets on a daily basis. We have different approaches and strategies, therefore IPOB is fully on the ground doing their work to restore Biafra sovereignty. In the run up to our referendum this year, the world will witness something totally unexpected and unique. Since Operation Python Dance II initiated by Nnia Nwodo and South East governors in the vain attempt to diminish the popularity of Mazi Nnamdi Kanu and IPOB, we are still conducting our meetings across the world and pursuing vigorously the liberation of Biafran people. The only thing the architects of Operation Python Dance 11 accomplished is to finally expose themselves for the self-confessed saboteurs they are. 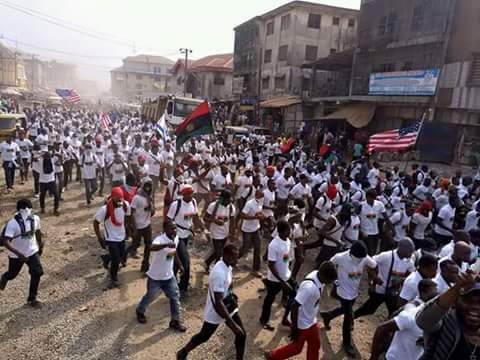 IPOB remains focused and determined towards the fight for Biafra freedom. Since the absence of our leader, more people have joined IPOB family meetings worldwide. Our leader bred and trained more of us who are committed to our noble cause. Biafra is more closer than many think because our leader Mazi Nnamdi Kanu knew that Nigeria and their handlers will come after his life that was why he structured IPOB the way it is today. Unless you are part of the very highest command of IPOB, you cannot understand the mode of our operations. We will continue our civil disobedience until Nigerian Army release our leader Mazi Nnamdi Kanu whom they kidnapped or presumably killed during the Operation Python Dance II in his home town on the 14th of September 2017. 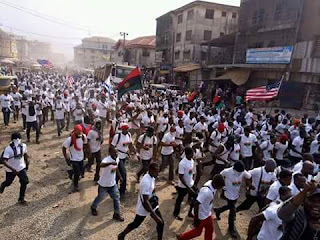 IPOB will remain non-violent till the day Biafra is restored. IPOB is deploying measures applying some that the eyes of any casual observer cannot see nor comprehend. Whatever methodology we apply, the outcome is decisively the same always. We have rendered the name Nigeria useless before the civilised world. Biafra is getting closer and closer with the passage of each day. The narrative by some Igbo politicians that IPOB has been subdued due to the abduction of our leader is false. Our activities are going on in earnest all over the world and preparations for our referendum is gathering momentum and we remain unstoppable as ever. – COMRADE EMMA POWERFUL MEDIA AND PUBLICITY SECRETARY FOR IPOB.